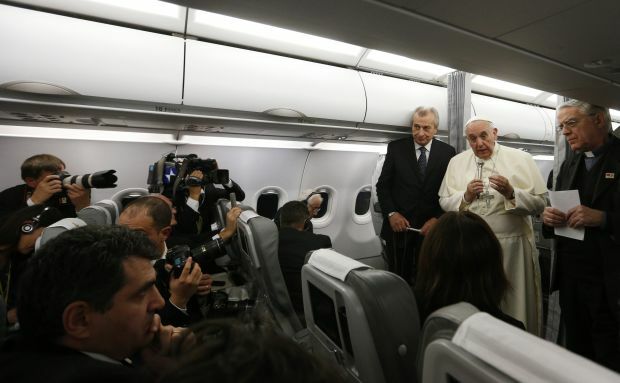 ABOARD THE PAPAL FLIGHT FROM ISTANBUL (CNS) — Pope Francis called on political and religious leaders across the Muslim world to condemn violence done in the name of Islam. The pope said he told Turkish President Recep Tayyip Erdogan Nov. 28 that “it would be beautiful if all Islamic leaders — whether they be political leaders, religious leaders, academic leaders — would say clearly that they condemn (terrorism), because that will help the majority of Islamic people to say, ‘that’s true,'” and show non-Muslims that Islam is a religion of peace. The pope made his remarks Nov. 30 during a 45-minute news conference on his flight to Rome after a three-day visit to Turkey. — The “substance” of controversial language on “welcoming homosexuals” in the midterm report at the October 2014 extraordinary Synod of Bishops on the family survived in the corresponding section of the final document, even though the latter was widely considered more conservative. He said the synod was not a parliament but an “ecclesial space where the Holy Spirit can work” and was just part of a process to be continued through the coming year of preparation for an October 2015 worldwide synod on the same subject. — Although difficulties remain in relations between the Catholic and Russian Orthodox churches, the pope is ready to meet with the Orthodox patriarch of Moscow as soon as the patriarch wishes to invite him. — The pope would like to visit one of the camps housing refugees from the civil wars in Syria and Iraq but cannot do so now because of security concerns. — He speculated, without naming names, that at least one of the governments that denounced the use of chemical weapons in Syria’s civil war may have been the source of those very weapons. — He praised Erdogan’s 2013 statement on the 1915 mass killings of Armenians by Ottoman forces — a statement criticized as inadequate by many Armenians, who consider the massacres a “genocide” — as an “outstretched hand.” The pope voiced hope that other gestures over the coming anniversary year would bring the two nations nearer, and he specifically voiced hope that Turkey would open its border with Armenia.